The updated version includes a double increase of the minimum wage. 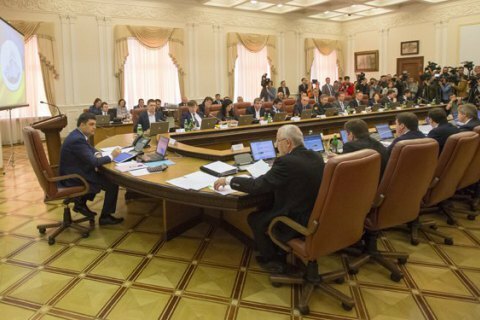 The Cabinet of Ministers at its meeting on 3 November approved the 2017 draft state budget for consideration in the second reading. The updated version includes a double increase of the minimum wage. "Our decision to double up the minimum wage, from 1,600 hryvnyas to 3,200 hryvnyas, is absolutely fair and absolutely real," Prime Minister Volodymyr Groysman said. In his words, the increase will be financed using funds received from bringing the economy out of the shadow and fairly distributing the budget. By the second reading, the bill was amended to incude higher spending on education, healthcare and defence (plus 1bn hryvnyas in guarantees). The cabinet also approved a package of bills under which the salaries of prosecutors, judges and other officials and court fees no longer depend on the size of the minimum wage. The draft law on the 2017 state budget must be given second reading by 20 November and third reading by 1 December. Parliament passed in the first reading the draft law on the 2017 state budget on 20 October.